Just wanna share this book with all of you. You can download for free here. 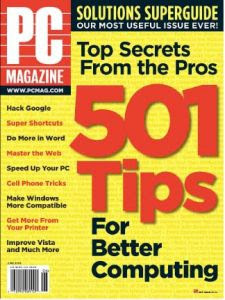 PC Magazine (sometimes referred to as PC Mag) is a computer magazine that is published monthly (until 2008 it was published biweekly except in January and July) both in print and online. The magazine is published by Ziff-Davis Publishing Holdings Inc. The first edition was released in January 1982 as a monthly called PC (the "Magazine" was not added to the logo until the first major redesign in January 1986). The magazine moved to biweekly publication in 1983 after a single monthly issue swelled to more than 800 pages.